You are here: Home / Parenting / I Can’t Believe You Just Said That! This is the ultimate guide for Christian families who are dealing with issues of whining, lying, tattling, defying, manipulating, interrupting, complaining, blame-shifting, teasing, aggravating, bragging, arguing, yelling, gossiping and bickering. For each of those issues, Ginger helps us understand the heart of the matter (where it’s coming from), how to communicating the problem, to ask them heart-probing questions (so they can learn to identify what they are doing wrong), how to reprove your child for that behaviour, train your child to speak with self-control and more. 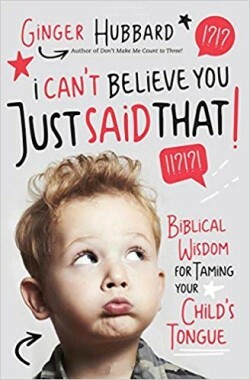 The book is not as helpful for me because although I’m Christian, I’m not raising my child specifically Christian because Dad is not Christian and I am a newer Christian. She does say it’s never too late to start teaching with the Bible in mind but I can’t do that because my husband and I agreed to respect each other’s faiths. However if you are a Christian household, you will find the book very helpful and full of sage advice. Buy I Can’t Believe You Just Said That at Amazon.com and help support the blog.